Established in 2005 by vocalist Giorgia Sacco Taz and guitarist Luigi Pressacco Italy's Silentlie finally release the first first EP, Blood Under Snow, self produced and distributed through Andromeda Records. They had some starts before including a demo and songs being used in compilations and one, River of Torments, part of the soundtrack for the movie Blood Sisters. Upon first spin I never would have guessed Silentlie has a female lead vocalist. Thanks to the almost muted nature of the vocal recordings and her tone, Sacco Taz nearly sounds like a man, at least in the first several songs. Once you get it in your head that she's a woman, you begin to hear the nuances. Yet, excepting maybe Any Emotion in You, Sacco Taz fights an uphill battle to rise above the music. The music is some hybrid of hard rock and heavy metal, with the dark atmosphere of gothic rock. The atmosphere created comes from boundless riffage creating a sturdy, but ubiquitous and predictable, wall of sound. Some light keyboards give some tune some glimmer. Yet the real strength here may be the roaring solos from Pressacco's guitar, especially within While I Hurt Myself, Cruel Look and Any Emotion in You. In the end, Blood Under Snow is one of those albums that proves to be an entertaining curiosity, something that you're not quite sure what to make of. This might be Silentlie's greatest strength. 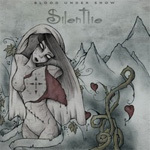 Silentlie's Blood Under Snow is a curious and entertaining album blurring hard rock and heavy metal, adding the dark atmosphere of gothic rock, and peppered with some fine guitar solos.